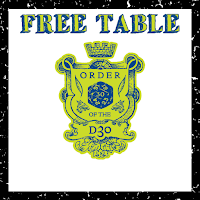 My newest d30 table has been posted on DriveThruRPG (and OBS). This is the last d30 treasure table, rounding out the small series of alternate treasure tables for OSR games. I seriously considered making one other set of tables of monster treasure types, but I thought that might be way too close to infringing on other's IP. As-is these tables can be used to generate alternate treasure in place of standard gems for any fantasy RPG. This last table covers paintings and other illustrative arts. Assuming you use the one sub-table, most of the works generated will be paintings, but you could also end up with tapestries, sketches, and a couple other types of illustrative art that might prove challenging to the party to monetize. 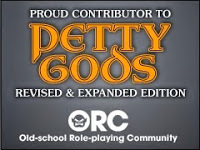 To get to the PWYW d30 table, just click on either graphic of this post, or use this link.